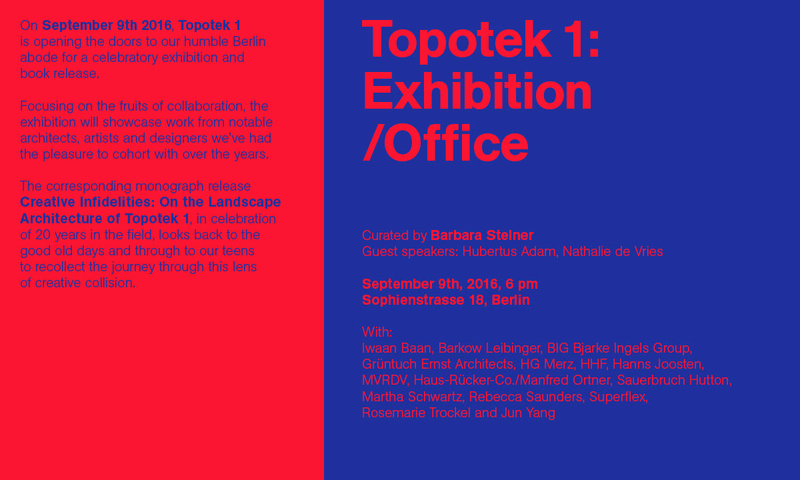 Topotek 1 is set to open their doors in Berlin for a celebratory exhibition of that showcases a selection of work by Topotek 1’s partners, highlighting the work of those we have had the joy to collaborate with along the way including works from Iwaan Baan, BIG, MVRDV, Martha Schwartz, Superflex, Sauberbruch Hutton and many more. 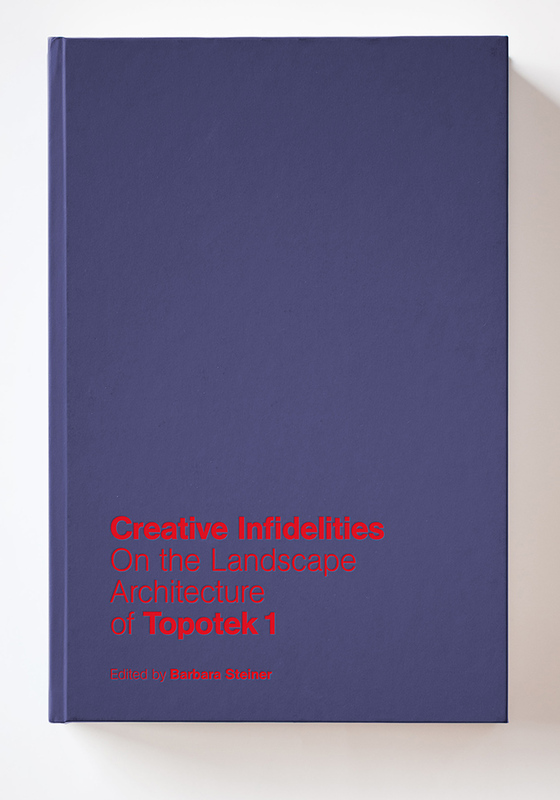 The opening will also include the corresponding release of Creative Infidelities: On the Landscape Architecture of Topotek 1 – a monograph publication highlighting the last two decades of work from Topotek 1. Back in 2002 in the exhibition “thinking + working”, Topotek 1 set up in Aedes Gallery, Berlin, bringing our desks, chairs and working tools right onto the gallery floor, offering a glimpse into the process of Topotek 1’s working. This year in 2016, with a focus on collaboration, Topotek 1’s office turns into a gallery space. The exhibition will showcase a selection of work by Topotek 1’s partners, highlighting the work of those we have had the joy to collaborate with along the way. Pieces for the exhibition include, among others: the original large-scale model of MVRDV’s renowned Rotterdam Markthal project; views of our collaborative project Superkilen from the perspective of Dutch architectural photographer Iwan Baan; Yvonne by artist Rosemarie Trockel; from the artistic and architectural Viennese group Haus-Rucker-Co, a 1986 original chalk drawing; screenings of the short film Paris Syndrome, from visual artist Jun Yang; and from Bijarke Ingles Group, the site model of Basin 7 (BSN7) plan for a new mixed-use neighbourhood in Aarhus Denmark. For the duration of the exhibition the office will thus take on a dual function, serving as both workspace and exhibition area. Opening celebration | September 9th, 6 p.m. Opening hours: Tuesday to Friday, 10 a.m. – 6 p.m. Looking at two decades of Topotek 1, the monograph publication highlights our firm’s most important approaches and methodologies, showcasing in detail a collection of significant landscape architectural projects. The publication features collaborative partners from the fields of architecture, art and design, along with private and public clients, planners, project managers and contractors who offer considerations of the joint undertakings from different angles. Allowing the readers not only to picture the complex realities of the field, but also an insider view of processes of collaboration. 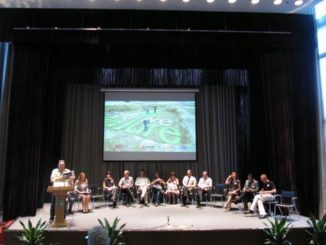 Particular emphasis is placed on the relation between single performance and cooperation, and the crossing of disciplinary and cultural borders.